Last edited by buzzkinz; 19-06-2013 at 04:18 PM. 3. @cafe Member can join all channels without restriction. 4. @cafe Member will get 50 points of EXP after you finished playing a game. 5. @cafe Member can upload avatar to profile. 6. @cafe Member can get friend lists max to 5 people. 7. @cafe Member can use Emoticons in chat room. 8. @cafe Member can show the channel status to all friends. 9. @cafe Member can use Privat Chat in Channel. 10. @cafe Member can talk in Clan Chat. 11. @cafe Member will get Special Icon in chat room. 3. VIP Member can join all channels without restriction. 4. 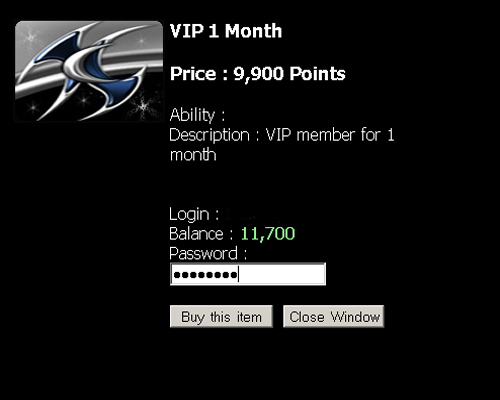 VIP Member will get 100 points of EXP after you finished playing a game. 5. VIP Member can use GHost++ and can use an Option : Use server to create game. 6. VIP Member can upload avatar to profile. 7. VIP Member can get friend lists max to 100 people. 8. VIP Member can use Emoticons in chat room. 9. VIP Member can show Rank in Ladder System. 10. VIP Member can show the channel status to all friends. 11. VIP Member can use Privat Chat in Channel. 12. VIP Member can Vote Player in Popular Vote System. 13. VIP Member can talk in Clan Chat. 14. VIP Member will get Special Icon in chat room. 3. Gold Member can join all channels without restriction. 4. Gold Member will get 300 points of EXP after you finished playing a game. 5. Gold Member can use GHost++ and can use an Option : Use server to create game. 6. Gold Member can upload avatar to profile. 7. Gold Member can get friend lists max to 200 people. 8. Gold Member can use Emoticons in chat room. 9. Gold Member can show Rank in Ladder System. 10. Gold Member can show the channel status to all friends. 11. Gold Member can use Privat Chat in Channel. 12. Gold Member can Vote Player in Popular Vote System. 13. Gold Member can talk in Clan Chat. 14. Gold Member will get Special Icon in chat room. 3. Platinum Member can join all channels without restriction. 4. Platinum Member will get 500 points of EXP after you finished playing a game. 5. Platinum Member can use GHost++ and can use an Option : Use server to create game. 6. Platinum Member can upload avatar to profile. 7. Platinum Member can get friend lists max to 300 people. 8. Platinum Member can use Emoticons in chat room. 9. Platinum Member can show Rank in Ladder System. 10. Platinum Member can show the channel status to all friends. 11. Platinum Member can create a CLAN. 12. Platinum Member can use Privat Chat in Channel. 13. Platinum Member can Vote Player in Popular Vote System. 14. Platinum Member can talk in Clan Chat. 15. Platinum Member will get Special Icon in chat room. 3. Diamond Member can join all channels without restriction. 4. Diamond Member will get 1000 points of EXP after you finished playing a game. 5. Diamond Member can use GHost++ and can use an Option : Use server to create game. 6. Diamond Member can upload avatar to profile. 7. Diamond Member can get friend lists max to 400 people. 8. Diamond Member can use Emoticons in chat room. 9. Diamond Member can show Rank in Ladder System. 10. Diamond Member can show the channel status to all friends. 11. Diamond Member can create a CLAN. 12. Diamond Member can use Privat Chat in Channel. 13. Diamond Member can Vote Player in Popular Vote System. 14. Diamond Member can talk in Clan Chat. 15. Diamond Member will get Special Icon in chat room. 3. Premium Member can join all channels without restriction. 4. Premium Member will get 1500 points of EXP after you finished playing a game. 5. Premium Member can use GHost++ and can use an Option : Use server to create game. 6. Premium Member can upload avatar to profile. 7. Premium Member can get friend lists max to 500 people. 8. Premium Member can use Emoticons in chat room. 9. Premium Member can show Rank in Ladder System. 10. Premium Member can show the channel status to all friends. 11. Premium Member can create a CLAN. 12. Premium Member can use Privat Chat in Channel. 13. Premium Member can Vote Player in Popular Vote System. 14. Premium Member can talk in Clan Chat. 15. Premium Member will get Special Icon in chat room. TCG Network Refill CenterSuggestion for Refill ACash following. - ACash cards have 28baht 55baht 89baht 159baht 245baht 349baht 450baht and 888baht. - 1 Baht a value equal to 100 Points. - You can choose a price of top up card which you want and you also can top up into your account anytimes. Note : Don't trust anyone to top up or buy Acash for your account. Otherwise TCG will not take responsibility for any cost occured. - Choose game / system : TCG Network- Write down Security Code- Press the button to Next for continue. 4. System of TCG NETWORK Refill Center will let you know about the details of your point for ensure top up is correct in this form. 5. 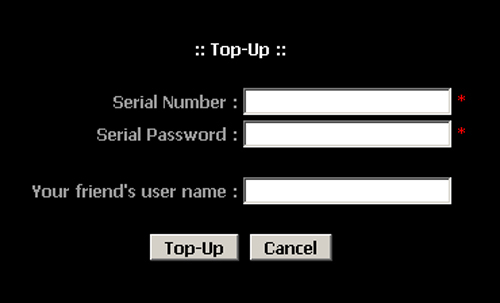 System of TCG Network Refill Center Will let you know when the top up process has been completed and then shows the serial TCG and password in this form. 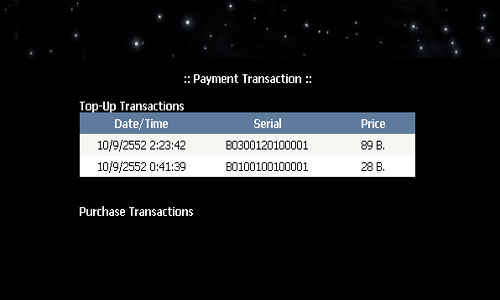 5.1 please remember Serial TCG and Password TCG for continue next process. 8.2 In the blank of Your friend's user name, please write down ID of your close friend for send "Free Bonus Point For Friend"
9. After top up completed then go to Tap :: Payment Transaction :: You can check balance of your account. 10. Go to Tap :: Item Mall :: For Buy Item in the item Mall in this form. 12. After finished buy item then go to Tap : Log out from the system and try to play in TCG Network. Last edited by buzzkinz; 23-01-2012 at 10:33 AM.